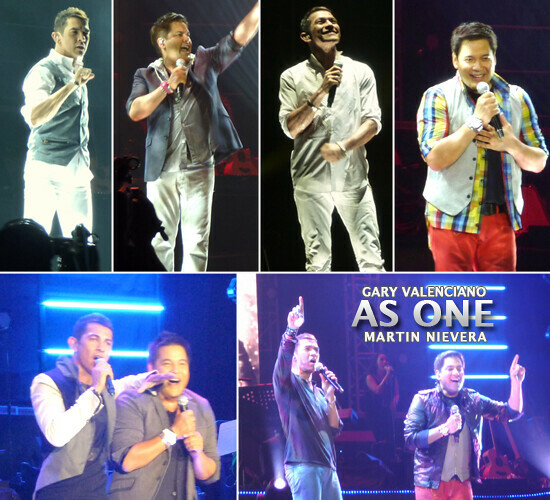 It took 10 months before Gary Valenciano and Martin Nievera were able to repeat their first "As 1" concert, this time at the Araneta Coliseum. I was privileged to watch them for the second time, with a seat better than last time's. Both Gary and Martin have proven time and again that they indeed deserve their titles Mr. Pure Energy and Concert King, respectively. Their performances brought the house dancing, singing, and shouting for more. Concert-goers were entertained with songs and dance numbers for more than 3 straight hours. There were no guests except for their children -- Ram, Robby, Keanna, Paolo, and Gab -- so they were literally the ones performing the whole time. Beat that! Martin's humor and wit gave the audience an instant stand-up comedy show. He made celebrity audience Joey Albert, Christian Bautista (@xtianbautista), and Aiza Seguerra (@aizaseguerra) sing impromptu songs, which the crowd really loved. Obviously, Gary was more serious and straight-forward, but was able to manage going with the flow with Martin. More pictures here. You may also like to read through my post during the first "As One" concert. I was able to take videos of the concert, but cannot have it posted online due to rights issues. Catch the "As One" concert to be televised on ABS-CBN this August.